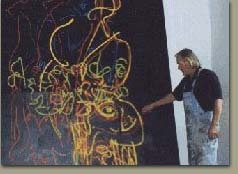 Peter Robert Keil was born in August 1942 in Züllichau / Pommern (now Poland). After the death of his father on the Eastern Front in the early years of WWII, mother and son set out to make their way through the chaos of battered Germany to West Berlin. There he grew up in the streets and backyards of a neighborhood of countless grey blocks of houses, seeking refuge in the trees of a nearby park oftentimes depicted in his paintings. The young Keil was excited by the world opened to him in the art book section of the local library. There he admired the works of the Expressionists, Picasso in particular. The pure energy of vivid color opened a pathway to temporarily escape from the dullness and depression of everyday life in post-war Germany as Peter made his first attempts at visual art. In the beginning, Peter studied and copied the style of the great master Picasso whom he later met in Spain. At the age of 15 he met the painter Otto Nagel, who was working on social background studies and became his first teacher and mentor. Otto Nagel introduced Keil to painting techniques, taught him realistic imagery, and how to deal with colors. As a young man, Keil accompanied Nagel on his tours of Berlin's back streets. They often painted from nature and the young Keil learned to see his neighborhood with the eyes of an artist. Teaching him the painter's craft and introducing him to outdoor painting, Nagel also influenced his motifs as well as his color palette and laid the foundation for finding his own voice as an international artist of note. 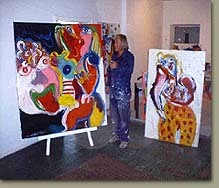 Keil refined his technique and broadened his knowledge when he studied at Berlin's "Akademie fur Bildende Kiinste." While at the Berlin Academy of Fines Arts, Keil treated his studies cavalierly. Thought to be an advanced student by his instructors, the Academy brought about some important acquaintances and contacts. There he met Baselitz, Fetting, Lupertz and Schonebeck and made friends with Salome, Schmettau and other important artists who help mold his artistic sensibilities. In 1961 Keil attended Baselitz’s and Schonebeck’s public presentation of their “Pandemonium Manifesto” at the “Grossgorschen 35” gallery. Keil also became at regular at Herta Fiedler’s who, much like Gertrude Stein in her day, became known as the “artists’ mother.” Keil was a well-known denizen of “Kleine Weltlateme” in Moritzplatz, a meeting place for the emerging avant-garde “Junge Wilde” (“Young Fauve”) artists, and he became the darling of art circles earning him the nickname the ‘Wildman of Berlin” for his passion for art, living, and lively conversation. The erection of the Berlin Wall interrupted the relationship with his famous mentor when Nagel was trapped beyond the Wall in East Berlin. Another important factor in those formative years of Keil’s artistic development was his close friendship with the painter Juan Miro whom he had met in Mallorca, Spain in the early sixties. Mirò repeatedly invited him to his studio in Palma, high above the Gala Major bay. The intense sunlight as well as the vivid colors of the Mediterranean region were important sources of inspiration for both Miro and Keil. From his friend Miro, Peter learned that "a picture begins to enforce and to reveal itself under the artist's brush during the act of painting." The freedom of rhythmic structuring, the verve and brightness of the ever-present vocabulary of primary colors and pure form lead him away from a realistic way of seeing and depicting his art to a freer, more “raw” neo-expressionistic style of painting. After Peter left Spain, he found a small studio in Paris near Place de Bastille. Living the carefree artist’s life in Paris, the young Keil had a great time in the cafes, bars and restaurants of magnificent city and all it had to offer. By day he studied the Old Masters in the museums, at night he painted portraits in bars to earn his living. He mingled with colorful characters, among them thieves, alcoholics, drug addicts, artists and streetwalkers who served as models for his sketches. Outcasts of the Parisian street scene and prostitutes were not only his subject matter, but often thankful customers. While in France, Keil continued to develop and learn dynamic and spontaneous brushwork techniques. Free of nature's constraints, the artist further distanced his painting from representational realism, seeking his own freer form. This heady environment, with its eschewing of bourgeois convention, held a strong attraction for the young artist. His newly found social awareness is reflected in his pictures and portraits which already carried his individual trademark style and color palate. By their coarseness, dynamism, vibrant energy and subject matter, his paintings from this period are now considered a visual record of the early phase of West German neo-expressionist painting. London was the young artist's next place of residence. There he rented a small flat in Earlscourt. For a year he enjoyed ‘Swinging London' before he found his way back to Berlin to paint on a full-time basis. Keil now lives there with his family for several months of the year and for the rest of the year he prefers the rural life in Bavaria or his condo in south Florida. During his German period, Keil was a contemporary witness of the consequences the erection the Wall had for West Berlin and the revolt against it. In one impressive painting he shows people protesting in front of Brandenburger Tor and he later often painted the place of protest, Glinicker Brucke, as a symbol of separation of East and West Germany and the torn German psyche. Even in his later work, a considerable number of paintings reflect Berlin’s ambiguous attitude toward life and politics in the late sixties and seventies. When the hippie movement engulfed Western Europe, Keil turned from observer to active participant. The chance of intensifying one’s excitement and inner images with drugs was an enticement he could not resist and critics often note what they assume to be a growing drug-induced sense of form, color, and composition in works of that period. On a less political side, Keil often painted typical Berlin street and bar scenes, women in various poses, fellow artists, and his beloved Lake Wannasee near the Berlin of his youth with its sailing boats, children swimming, and sun-seeking bathers. Sometimes in rich unnatural colors, these paintings along with his figure studies help establish Keil as a versatile master craftsman of neo-expressionism and they are especially desirable to collectors. Back to top - See the gallery.